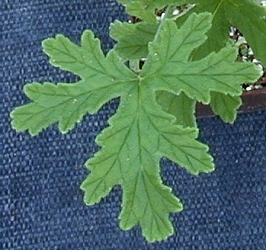 Grown for their uniquely scented and often ornamental leaves, Scented Geraniums are fast growing and highly tolerant of variable soils and conditions. They vary in heights and widths. Some are more tolerant of cold and some are more tolerant of shade. Stroking their leaves or splashing water on them on a hot summer's day is joy not to be missed. Wherever you put them, make it close to you. You will want to brush against them often. Plant patches of them in all your garden beds so that when you prune your other plants you will become engulfed in their fragrance. 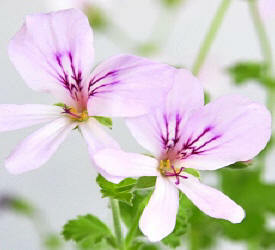 Here are a few things to consider once you decide to add Scented Geraniums to your garden or patio. 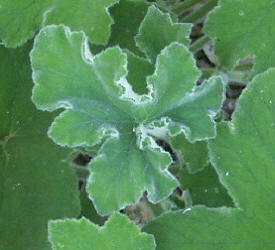 HARDINESS: Scented Geraniums die if they get too cold. Here in Zone 8, we usually have good luck with the larger leaved varieties surviving in the ground as long as we don't actually reach our average winter time temperature of 10 degrees. We are rarely below the mid 20's and they do fine. They will die back to the ground but return (most years) in the spring. Smaller leaved varieties, like Lemon Crispum and Prince Rupert, do best in Zone 8 if their dead stems are left until the plant has grown up around them in the spring. 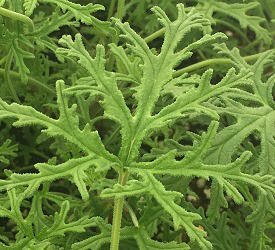 Often these stems are not actually dead, just dormant, and will produce new leaves in the spring. 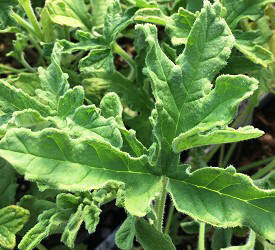 Larger leaved varieties, like Attar of Rose and Peppermint, may have their dead stems removed in winter or spring. In Zones 9 and up, where these lovelies are evergreen, fall pruning of long and lanky stems to a fairly short length will produce a tidier, more attractive-looking shrub in the spring. 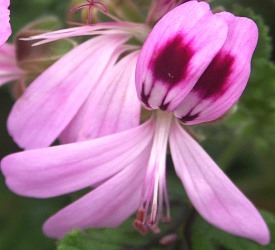 LOCATION: SOIL and SUN Scented Geraniums range from 12 inches tall (Nutmeg and Fringed Apple) to 3 feet tall (almost all of the rest of them) and from 12 inches wide to 8 feet wide or more. They mix well with other landscape plants to add color and texture. We have planted them at the top of walls and the bottom of hills. Scenteds (as they are often referred to) like it warm, sunny and dry. 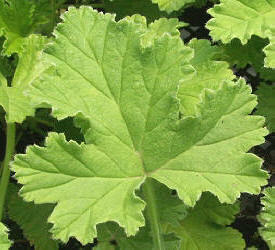 If you are having a hard time getting something to grow in a certain area, try a Scented Geranium. If planting in the garden, the soil needs to contain enough air pockets to allow water to drain freely and enough organic matter to hold the moisture so that the plants don't dry out too quickly. If water puddles where you want to plant, then choose another spot. Mulching the bare ground around your scented geraniums with compost or other organic matter will, over time, help create the perfect soil. As mulch breaks down, earthworms and other beneficial bacteria take essential elements below the surface, which not only enhances the texture of the top soil layer, but also helps to correct pH, which should be somewhere in the neutral range, and improve fertility. If you are not mulching, and your soil has poor fertility, then apply an all-purpose organic fertilizer once or twice a year. If planting in a container, use a high quality organic potting soil with lots of texture and organic fertilizer. Our three-inch pot should be transferred to a pot that can hold about three gallons of soil. Each spring, check the root ball to make sure it has not filled up the pot. Root bound Scented Geraniums should either be repotted into a container at least two gallons larger or root pruned and returned to the same container with fresh soil added. 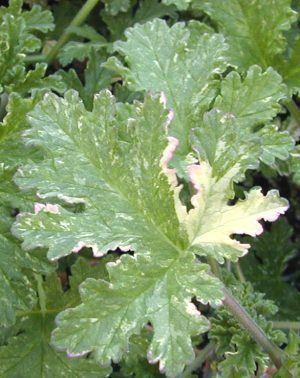 Container-grown Scented Geraniums will need continual fertilization with an all-purpose organic fertilizer throughout the growing season. 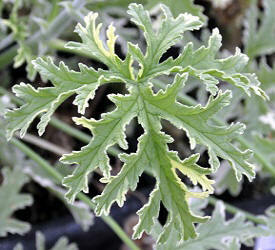 Scented Geraniums love the sun, but most do well in partial shade in southern areas. 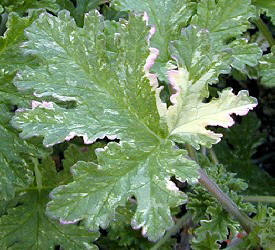 A Scented Geranium that does not get enough light will be leggy and will develop fewer essential oils. Sometimes you just have to try the plant in an area to see if it will be happy. 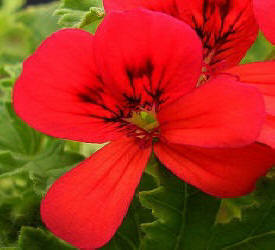 PLANTING: Scented Geraniums should be watered in the three-inch pot before trying to remove them. Plant them at the same depth they are in the pot; not planting deeper or higher. Dig a hole just big enough to plant the starter Scented Geranium and water well. Check often to make sure the little plant's root zone is not dry. Until it takes off into the soil around it, the original root cube needs to stay moist. This usually takes about a month depending on the time of year. Be sure to gently firm your little plant into the ground so it makes good contact with the native soil, but don't smash the soil so hard that the soil becomes overly compacted. 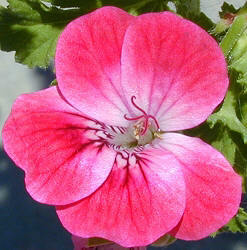 WATERING: Once established, Scented Geraniums don't take a lot of water but they do need some. Leaves should never be allowed to wilt but the soil should not be wet enough to make mud pies. In humid areas, drip irrigation is advised to keep moisture off the leaves. Keeping the leaves dry helps to thwart fungal diseases. If you use drip make sure to expand the wet area as the plant grows bigger. Overhead watering is not usually an issue in a container or in a hot, dry climate. Indeed, watering overhead in a dry climate cleanses the leaves of dust which is a healthier environment for all plants. How often to water is an age-old question that can only be answered by each gardener. Sites, soil and conditions vary to such an extent that only on-site inspection can answer this question. 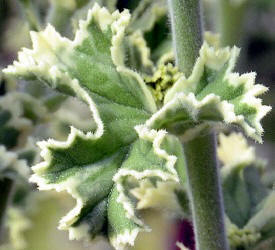 PRUNING: The only reasons to prune a Scented Geranium is if it outgrows its space, has dead stems or needs to be shaped. They are perfectly happy left alone. If you do prune, be sure to use the leaves for crafting or cooking. 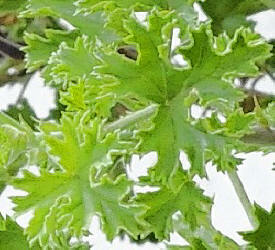 CRAFTING: Leaves of Scented Geraniums add interest to fresh flower arrangements. Peppermint, Peacock, Skeleton Rose and Mint Scented Rose are really nice in small bouquets. They last about a week in water. 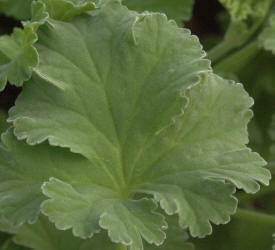 All Scented Geraniums can add add bulk and fragrance to potpourris and sachets when dried. 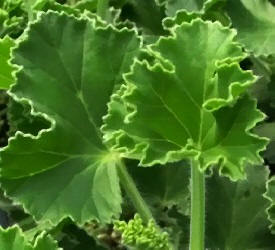 CULINARY USE: Scented Geraniums have been used in cooking for centuries. 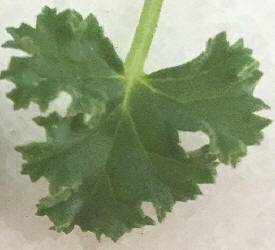 Normally, we don't really eat the leaves but use them as flavoring and scenting agents. 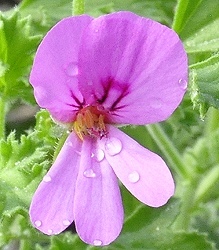 Attar of Rose Geranium leaves packed into apple jelly or laid at the bottom of a cake pan before the batter is poured add a bit of Je ne sais quoi, that little bit of some indefinable extra. 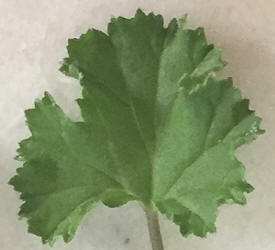 Lemon cripsum leaves were often layered with sugar and left to scent the sugar. Today, there is more use for the beautifully colored flowers than the leaves (which frankly can be a bit hairy)! The delicate flowers can be added to salad or stir fry. They can also be candied and used to decorate desserts. 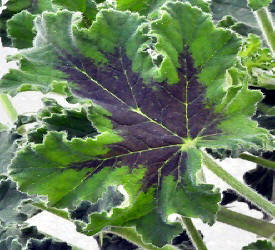 All of our Scented Geraniums are safe to use in cooking as long as they are grown organically. 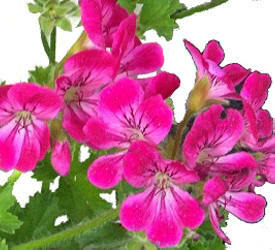 That Scented Geraniums are native to South Africa? That, at last count, there were over 250 known varieties? That they cool themselves by releasing oil from glands on the backs of their leaves? That the Victorians thought they were Geraniums? That they aren't Geraniums but Pelargoniums? 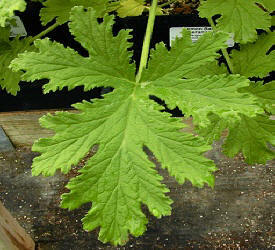 That their cousin the Martha Washington Geranium is reputed to smell like dead fish? 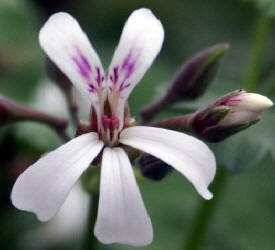 and that it also is not a Geranium, but a Pelargonium? That just by laying some washed and dried leaves on an inch of sugar, covering with an inch of sugar, and leaving for a week, you can have scented sugar to use in teas and baked goods? That dried leaves can be added to potpourri and sachets and, if left whole, will keep their fragrance for a long time? 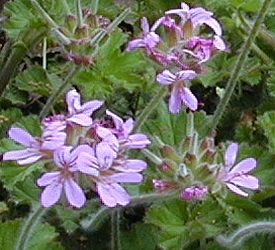 That oil distilled from Rose Geraniums is often used in the perfume industry in place of the expensive Attar of Rose oil?